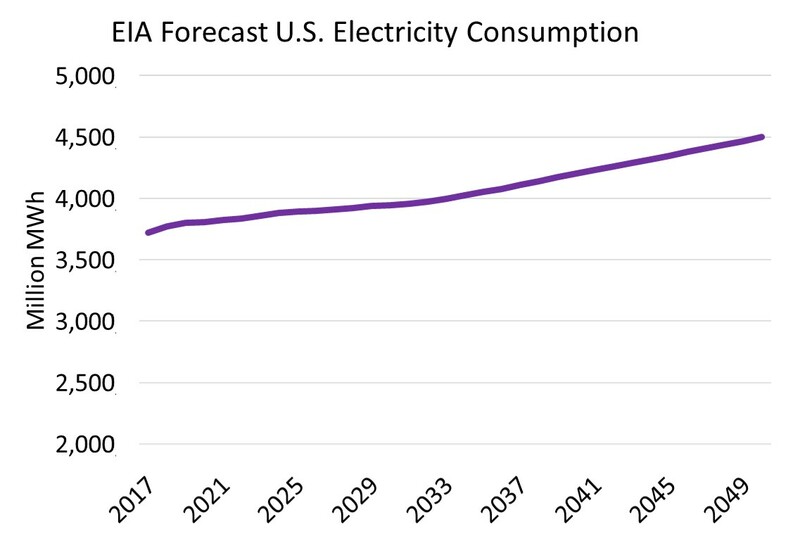 Indeed, the latest forecast from the Energy Information Administration (EIA) forecasts a 0.8% average annual growth between now and 2050. Declines in sales coupled with growing economic opportunities for rooftop solar and other distributed energy resources (DERs) has utilities worrying about the so-called utility death spiral. 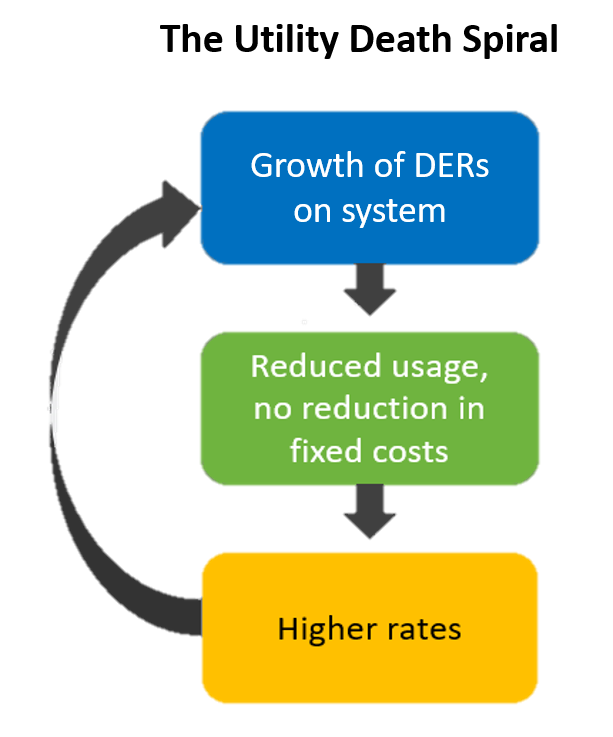 Utilities with primarily fixed costs have sales declines that result in rate increases; this encourages more load to leave the system, which results in more rate increases. It’s an ultimate deadly spiral of business decline. Emissions efficiency means providing consumer benefits for the least amount of negative environmental outcomes, including the least amount of GHG emissions. 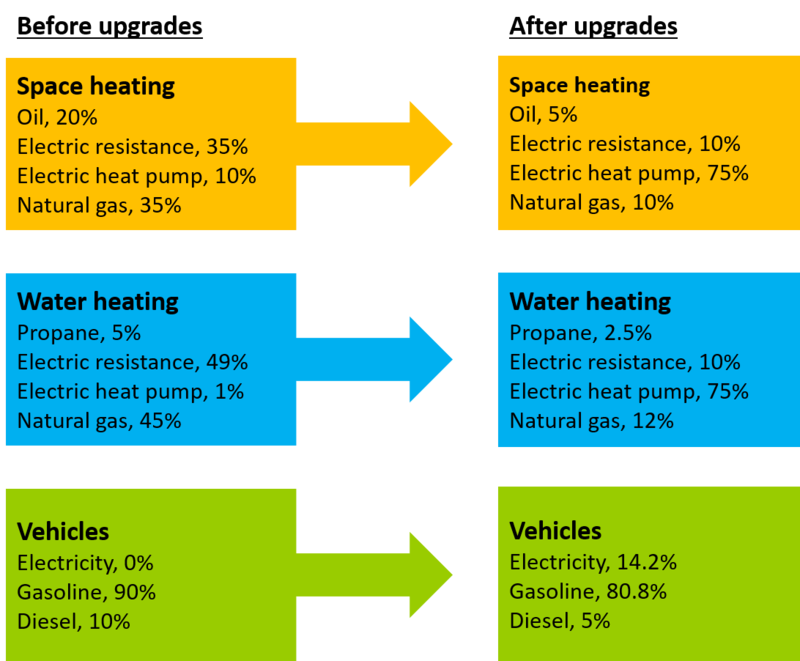 It concludes that moving three key energy uses – vehicle transport, space heating, and water heating – from fossil fuels to electricity can provide significant environmental benefits while continuing to fulfill consumer desires. The authors of the above-mentioned article considered a hypothetical electric utility with 100,000 consumers and a generation mix of 50% coal-fired, 40% combined-cycle gas turbine, and 10% gas-fired combustion turbine. These customers were assumed to use a mixture of fuel oil, electric resistance heaters, electric heat pumps, propane, and natural gas to heat their homes and water. Gasoline and diesel powered their cars. Upon the upgrades shown below, GHG emissions were modelled to drop by 25%. Penetration of electric vehicles (EVs) is small. Significantly more emissions reductions could be achieved by converting the electric generation mix to utilize zero-emissions generation like wind, solar, or nuclear. Will electrification result in significant electric load growth? The concept of beneficial electrification creates new growth opportunities for electric utilities. Electric vehicles (EVs) utilize electricity in the range of 25 to 35 kWh per 100 miles. A homeowner driving an EV 10,000 miles in a year would add 2,500 kWh of energy consumption to his bill. With a typical U.S. residential account currently using about 10,000 kWh per year, the addition of an EV could increase that home’s electric usage by 25%. Adding heat pumps for water heating and space heating might add an additional 4,000 kWh per year. The net total increase in electric usage would be 65% — all while significantly reducing the GHG emissions from the home. Given these numbers, it seems electric utilities have much to gain by touting the environmental benefits of electrification. And this may be the big opportunity that can save these companies from the utility death spiral. This entry was posted in Electricity and tagged Energy Efficiency, Environmentally Beneficial Electrification, Utility Business. Bookmark the permalink.